Background: Situs inversus totalis (SIT) is a rare entity which has been estimated to occur in the range of 1:10000 to 1: 20000. 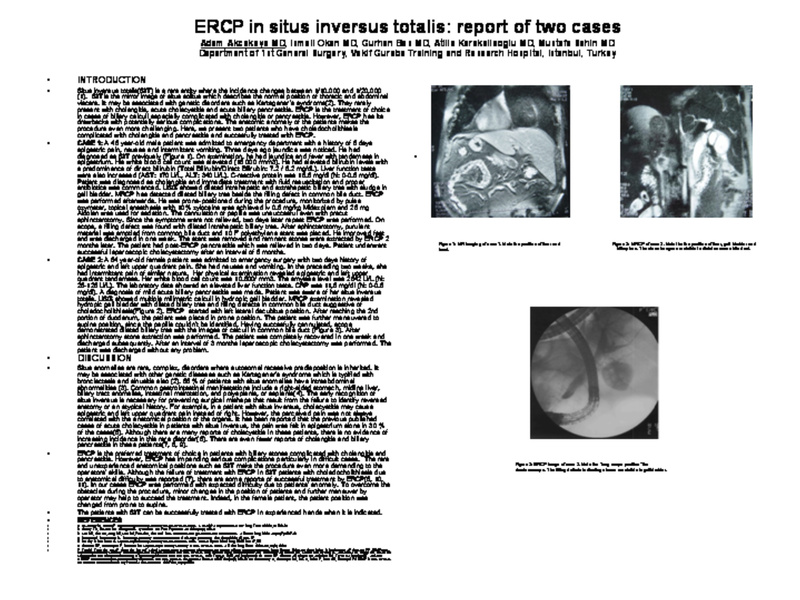 We present two cases of situs inversus totalis who successfully underwent ERCP and subsequent laparoscopic cholecystectomy. Case 1: A 45 year-old male patient with known situs inversus totalis was admitted to emergency department with the diagnosis of cholangitis. Elevated bilirubin and leucoytosis were noted. USG showed dilated intrahepatic and extrahepatic biliary tree with sludge in gall bladder. MRCP has detected dilated biliary tree beside the filling defect in common bile duct. ERCP with precut sphincterotomy was performed. Since the symptoms were not relieved, repeat ERCP and stenting with 10 F polyethylene stent was performed. The patient improved and was discharged afterwards. The stent was removed 2 months later. Patient underwent succesful laparoscopic cholecystectomy after an interval of 3 months. Case 2: A 64 year-old female patient was admitted to emergency surgery with the diagnosis of acute biliary pancreatitis. Patient was aware of her situs inversus totalis. USG showed multiple milimetric calculi in hydropic gall bladder. MRCP showed hydropic gall bladder with dilated bilary tree. ERCP has shown dilated biliary tree with the images of 3 calculi in common bile duct. After sphincterotomy stone extraction was performed. The patient recovered. After an interval of 3 months laparoscopic cholecystectomy was performed successfully. The patient was discharged without any problem. Conclusion: ERCP and laparoscopic cholecstectomy can be safely managed in patients with known situs inversus totalis when necessary.